Today, more than ever, our young people need positive role models, young Caymanians that they can look up to. Their messages need to be heard.There are many ways you can help us advance our goals. We are always in need of volunteers and support for our events, including hostesses, administrative staff, and others. You can also help us with our fundraising efforts, by involving your church, your school or the company or organisation for which you work. Contact us and we will work with you to create a programme tailored to your group or civic organisation. We will work with you to organise an event such as a walk-a-thon, car wash, bake sale or other activity. Please feel free to take a creative approach, and we will help make it happen. 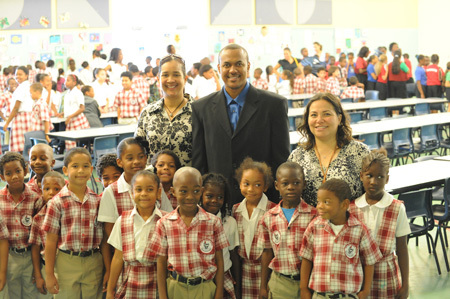 Together we can make a difference in the lives of Cayman’s youth. You can also help us by nominating someone for a Young Cayman Leadership Award, and by following us on Facebook, attending our events, and telling others about us. Please consider some of the many ways you can make a difference by supporting the Foundation. Our youth need to hear the messages of these young Caymanian leaders who have gone just ahead of them. In a world of conflicting and confusing influences, they need to see that there are positive role models in our society. They need to understand that they have options. We are very grateful for the corporate donations we receive from leading companies that are committed to recognising young Caymanian leaders. Their role is critical. Nevertheless, in order to be truly effective, we need the support of the entire community. Individual or group contributions of any amount make a tremendous difference in our ability to continue our programmes. Whether a private donation or proceeds from a group fundraiser, church or civic club, your support will help us build a stronger community and a better tomorrow for the youth of the Cayman Islands. Your company might consider matching employee contributions, providing a meaningful way for employees to participate in their community. You might also consider a more significant gift with a lasting impact, such as a charitable bequest made through your will, or a tribute gift to honour a loved one or friend. Whatever your contribution, we greatly appreciate your support. The journey to becoming a leader isn’t easy. There are many barriers and roadblocks along the way. The Young Caymanian Leadership Award provides a simple but effective means of providing our next generation of leaders with the encouragement and acknowledgment that will help fuel them through the next phases of their leadership journey. Help us focus the country’s attention on their efforts with a sponsorship, table donation or by purchasing a table to come celebrate them with us. We know there are a lot of requests for sponsorship funds these days and many of them are for very worthy causes. What YCLA provides is critical to ensuring that our bright and rising stars stay on the path and take us all to new heights in the future. Who and what we acknowledge is how we shape and nurture our young leaders. If you would like to partner with us in seeing Young Caymanians equipped, empowered and recognised as the leaders they are and are growing to be, please email Brianna at brianna@ycla.ky to learn more about our Sponsorship Packages. Also, visit our Sponsors and Partners page to learn more about our current sponsors and partners.